DARKENED NOCTURN SLAUGHTERCULT is a female-fronted German black metal quartet that has gained notoriety in the underground scene over the past twenty years and garnered a lot of attention without having to surface into the mainstream. They are widely known among kvltists for their uncompromising live performances lead by their vocalist ONIELAR’s eerie stage presence and axeman VELNIAS’ intimidating stance that demands respect without having to speak. Born in the late 90s, DNS’ was inspired by black metal giants like IMMORTAL, GORGOROTH and DARK THRONE and decided to make a classic, raw sound in line with the said bands and give it a distinctive touch of their own sound. Since their debut release “The Pest Called Humanity”, they have successfully released five studio albums until 2013. Six years after “Necrovision”, the Slaughtercult is ready to release their sixth incarnation, “Mardom”. “Mardom” is a classic sounding Scandinavian-inspired black metal album, and by the band’s own words, “almost forgotten traditions are kept firmly”. While that makes the album quite predictable, that doesn’t affect the album’s stellar quality in terms of production and songwriting. The rawness and sheer darkness is the main asset of this album and you can be assured that what you’ll get in the album would feel like it came straight from the abyss. Aside from the rawness and darkness of the songs, one more thing they employed is a heavy and grisly ambience that develops naturally by the combo of the guitars and drums behind Onielar’s primal screams and ghastly howls. Right from the instrumental prelude “Inception of Atemporal Transition” you’ll feel that dark atmosphere that comes along with the instruments. And when the first song “Mardom – Echo Zmory” arrives, everything’s just crushing – from the old school riffs, the signature drums down to the vocals. “A Sweven Most Devout” has even more power in it and it was sustained until the very dark and cryptic song “T.O.W.D.A.T.H.A.B.T.E”. While the song clearly discusses the gloominess of death, the title gives enough reason for an attempt of decryption. Some lines from the song say “It is the one whose glory extends above circles of high, whose might roots in the abysmal below, it is this exalted genius they decry, with utter ignorance and asinine woe”. Golden poetry is what really gave even more gloom and eeriness to the songs, just listen to “A Beseechment Twofold”. The band played a masterful performance throughout the song and Onielar was really on point doing grisly shrieks on top of a rumbling drums and a thundering bass work. But what will really amaze you is the high level poetry and the very deep lyricism. If you closely pay attention to what Onielar is saying, you’ll hear chants of pure strain of hate that is delivered with such top-class creative verbiage. “Exaudi Domine” takes on you like a storm, with its fast-paced drums, crazy trem picking and thick bass. From that point onwards, the energy just kept on kicking up and they never looked back. One surprise track is “The Boundless Beast”, where the dark ambience is on top form. It contains some doom cuts especially on the bass and it helped in creating a very atmospheric feel. Among the tracks this song is also more dynamic, having shifts in tempo and mood here and there. It also featured a male growl in the middle of the song that perfectly complemented Onielar’s shrieks and howls and provided a more gloomy touch to the song. The album’s highlight, “Imperishable Soulless Gown” comes in like an avalanche with a little aid from the momentum-builder instrumental “Widma”. When I say it comes like an avalanche, it is because of its relentless sonic assault right in your face straight from the first note down to its closing end. “The Sphere” is another reborn classic that puts an exclamation point to the album that was excellently opened by the “Inception of Atemporal Transition”- “Mardom – Echo Zmory” combo. As merciless as DARKENED NOCTURN SLAUGHTERCULT has ever been, and just as destructive as DARK THRONE and IMMORTAL classics. With “Mardom”, what you’ll get is not simply a black metal record. 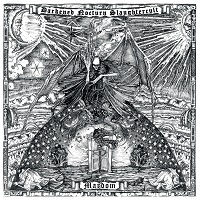 It is a black metal record with pure dark intent, an on-target sonic assault, a pinch of top-class poetry and a beastly reincarnation of the classic Scandinavian black metal sound you will truly love. If you are that fan that denies the need for innovation and sticks firmly with a fire-and-blood forged tradition, this album is definitely for you.